02:15:00 Makes 12 servings, 1 dessert cup (68 g) each. 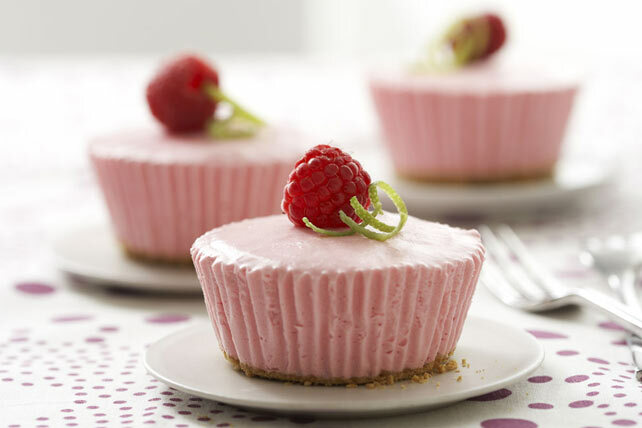 We call these mini desserts Raspberry Dream Cups, but they taste just like no-bake cheesecakes! We like them mini, but you can prepare this recipe in a springform pan if you want a tart instead. Sprinkle graham crumbs onto bottoms of 12 paper-lined muffin cups. Add boiling water to jelly powder in large bowl; stir 2 min. until completely dissolved. Cool 5 min. ; pour into blender. Add cream cheese product, cottage cheese and lime juice; blend well. Pour into large bowl. Whisk in Cool Whip. Prepare dessert as directed, substituting 9-inch springform pan sprayed with cooking spray for the lined muffin cups. These tasty desserts can be part of a healthful eating plan. Serving Size Makes 12 servings, 1 dessert cup (68 g) each.